Home ⎢Permanent Change: When Have We Learnt? Permanent Change: When Have We Learnt? If our definition of learning assumes that learning involves a permanent change in behaviour, then how long is permanent? If a change occurs, but it disappears as soon as the student leaves the class, then did they learn? I think most people would say no. If they retain that change for four hours, would we say that was “permanent” and they have learnt? What about four days, or four weeks, or four months? This is a fundamental problem with most scuba training. We do not look for permanent change. If the student can perform the skill right now, then we tick off that skill on a checklist and move on to the next. There is no consideration as to whether they will be able to perform the skill in a week or a month or under stressful situations. In addition, many scuba classes are structured to be taught in convenient four-day blocks. The instructor dutifully presents the materials, and then tests that the student has understood it. The instructor gives the students a chance to practise the skills or knowledge, and at the end of the course, the instructor checks that they have retained the knowledge and can perform the skills. After all this, the student and instructor are confident that the instructor has done a good job and the student has learnt. However, we can now see that if it is a permanent change we are looking for, then we are wrong to say that the student has learnt. It is only if the student retains this information permanently that we can say they have learnt. This means that a scuba course, whether it is an initial open water course or a more advanced technical diving course, is just one part of the learning process. Both instructors and students must realise that the end of the course is just one step on the way to total learning. This may be revolutionary for some parts of the diver training industry, but it should not be a surprise. Teaching theory has recognised this for many years. 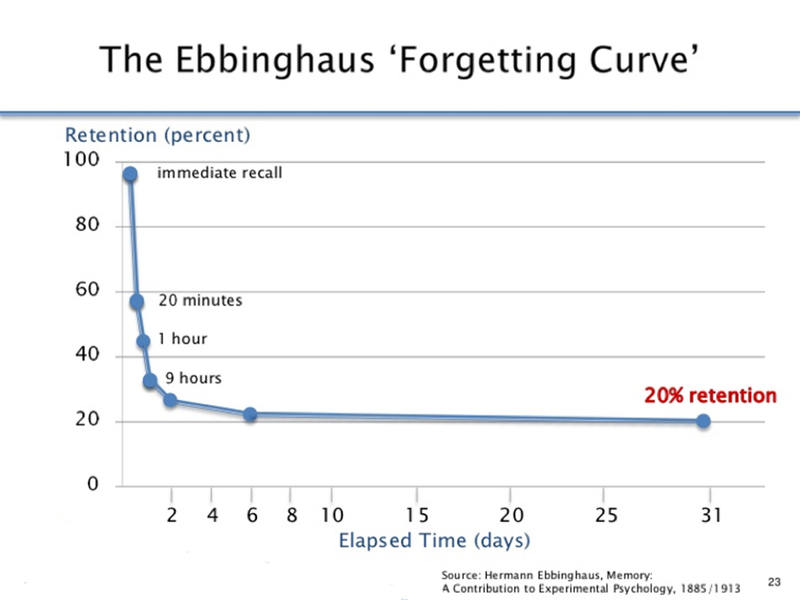 In 1885, German psychologist Hermann Ebbinghaus described what he referred to as the forgetting curve. This refers to the fact that information is lost over time when there is no attempt to retain it. 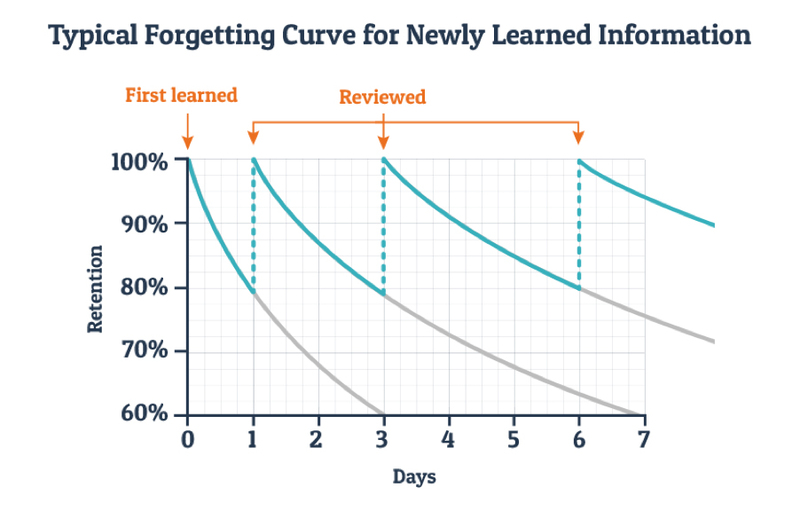 The forgetting curve is shown in the diagram below. This shows that even if the student has 100 percent retention after being taught a topic, that retention will rapidly fall over time before levelling off at a much lower level. Most instructors will be familiar with the experience of teaching students and getting them to retain an idea or a concept, only to find that when they return to it the next day, the students have forgotten the concept. You can see that over time, only 20 percent of the information or skills are retained. This is a frightening statistic when you consider that most of the topics in any diving course are in there because they are considered essential. If only 20 percent of the information or skills are retained, that means that 80 percent of that essential information and skills has been lost. An example of the forgetting curve in practice was demonstrated by a 1988 study. A number of university students were split into two groups. The first group attended an introductory psychology course, successfully completing the whole course and passing the final exam. The second group did not have any involvement in the course. Four months after the course, both groups were given a test on the material covered in the course. The first group, who had studied and passed the course, scored on average 8 percent better on the test than the second group who had never studied the material. We see this again and again in the diving world. Instructors are covering all the material, but students are not retaining it. This results in students who have forgotten most of what they were taught and are at a level not much above someone who was never taught the information in the first place. This situation can be improved by reviewing the information or practising the skills. This is why good instructors give students a chance to practise skills and review knowledge. Each review or practice gives a boost to the level of retention, and even though the retention will still drop off, it will be slower and will drop to a lower level than if no review had been carried out. However, you can see in the diagram below that with a review one day after first learning the concept and another review three days after first learning the concept, retention still drops to 70 percent after eight days. Each subsequent review will improve the situation but for a four-day course, the first few reviews can be included by the instructor as part of the course but any subsequent review will have to be done after the end of the course and is beyond the control of the instructor. This means that whether the student permanently retains that information—in other words, whether the student learns—is not determined by what happened during the course but by what happens in the weeks and months following the course. It is essential for the student to continue to review the information and practise the skills they were taught after the end of the course. This is particularly relevant for skills that are only normally used in an emergency situation, such as mask clearing, rescue techniques or CCR manual control. These may be taught and practised on a course, but as they are not a routine part of diving procedures, they may not be practised after the course. Then, when they are needed, the forgetting curve means that the retention of those skills has dropped to such a level that the diver cannot perform the skill when required. This means that one of the most important skills an instructor can pass on to a student is how to ensure their skills and knowledge continue to grow rather than drop off over time. With diving, the situation is more complicated in that we are primarily concerned with practical skills rather than theoretical knowledge. When learning skills, there are a number of stages of learning that students go through. Cognitive stage. The first is known as the cognitive stage. This is where the students learn the various steps involved in performing the skill so that they “know” how to perform the skill even if they cannot actually “perform” the skill. For example, it is relatively easy to explain to someone the steps involved in juggling three balls, and they may be able to repeat the steps back to you, but that does not mean they know how to juggle. Associative stage. The next step is known as the associative stage and is where the student actually starts to “perform” the skill. In our example, they might start to try juggling and may well be able to briefly keep three balls going. However, at this stage, it will require all of their concentration, and any interruption is likely to throw them off. Autonomous stage. The third stage is known as the autonomous stage, and this is where the student can maintain their juggling, possibly while talking or moving around. Mastery. Some researchers define a fourth stage known as mastery. For example, if you are juggling chain saws or knives, there is no room for error, and doing this—especially while balancing on a tightrope or unicycle—would definitely display mastery. Obviously, mastery requires a huge amount of practice, so what stage of learning is it reasonable to expect students to achieve with regard to, say, buoyancy or mask clearing during a four-day open water course? Would we expect them to achieve the cognitive stage during their open water course? Yes, I think anyone would agree, they certainly need to “know” the principles of buoyancy control or mask clearing. Would we expect them to achieve associative learning? Again, yes, I think everyone would agree that all students should be able to “do” a mask clear or demonstrate buoyancy control. What about the autonomous stage? Is it reasonable for us to expect them to do it “automatically” after a four-day open water course? In this case, I think the answer is no. They need to be able to do it, but it is just not reasonable to expect them to achieve the automatic behaviour required for this third stage. If they are not going to achieve this level during an open water course, then when will they achieve it? The sad truth is that many divers do not achieve this third stage of learning. Not only that, they may even drop back to a previous stage. The hours of practice required to maintain their skills, let alone move from the associative stage to the autonomous stage must come with further practice that can only be achieved after the initial training has occurred. This further practice can be achieved independently, with the diver practising with a buddy, or it can be achieved with an instructor. This is one of the main benefits of continuing education; it allows new divers to continue practising and progressing towards the autonomous level under the supervision of an instructor while adding on further skills and knowledge. 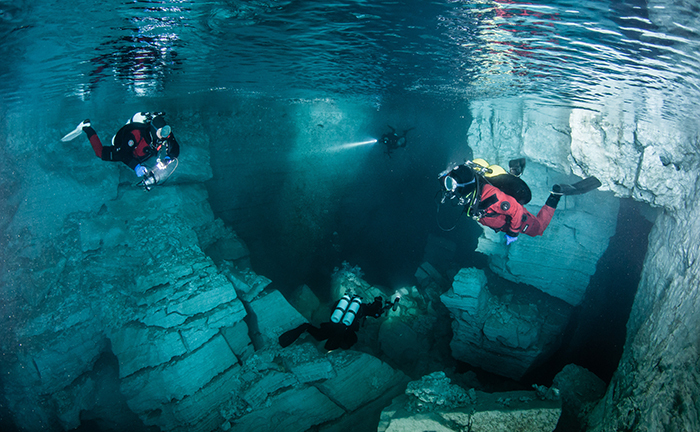 Mark Powell is one of the leading technical diving instructors in the field. He has been diving since 1987 and instructing since 1994, and is a full-time technical diving instructor for several leading agencies. He teaches all levels up to and including Advanced Trimix. In addition, he has led a number of expeditions to various parts of the world, including the Middle East, Costa Rica, Malta and the Red Sea, but is usually found diving the wrecks around the coast of the United Kingdom. For more information on any aspect of technical diving, visit: Dive-tech.co.uk.